Uncertain Greek Bronze, probably Byblos in Phoenicia. AE 21. I have attempted to identify this bronze, but have not been able to do so with certainty. It is 21 mm, 7.56 grams. The obverse looks like it could be Zeus or Poseidon. The reverse is clearly Isis holding an sail (I have no idea why many reference refer to it as a veil). The Isis with sail reverse strongly suggests an issue from Byblos in Phoenicia, but I can find no match to it. The coin is over all Fine, with a brown patina and slightly rough. If it had inscriptions, they are not missing due to wear or corrosion, but might have been weakly struck. Or it may not have had inscriptions. There are coins of both Commodus and Macrinus that look a lot like this, but the portrait is clearly not that of a Roman Emperor. If this is a coin of Byblos it is an anonymous issue and may or may not belong in that period. The fabric and style suggests to me it is earlier, most likely 2nd or 1st century BC. There is a countermark on the obverse (lower left) that is clearly a bird, and while it might be an eagle it looks more like rooster. 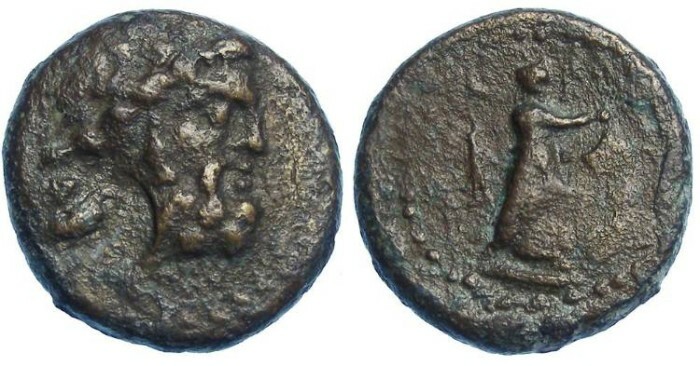 It is offered here as a mystery coin, as I don't have a specialty reference on Byblos to confirm it from, and I have spent as much time trying to identify it as I am prepared to.